On September 3 and 4, the Beijing Summit of the Forum on China-Africa Cooperation (FOCAC), seen as China’s most important diplomatic event this year, was held in Beijing. 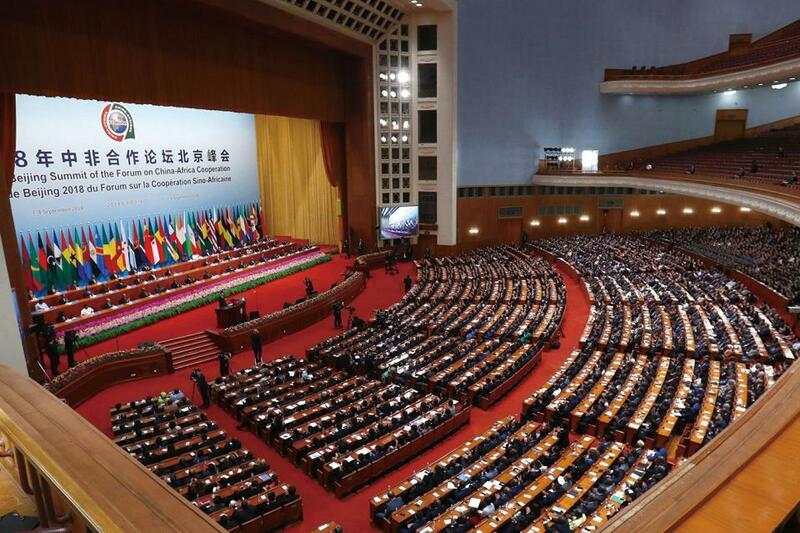 Featuring 53 out of 54 African counties, (except eSwatini formerly Swaziland, which maintains diplomatic relations with Taipei,) along with the African Union, the Beijing FOCAC Summit was the biggest since it was established in 2000. As expected, Chinese President Xi Jinping delivered a keynote speech reiterating the “common destiny” of China and Africa, a concept that has developed into a cornerstone of China’s global diplomacy over the past couple of years. As the trade war between China and the US intensifies, there is no doubt that Xi’s rhetoric refers to the US. Both China and Africa will suffer from this trade war, said Liu Guijin, who served as the first Special Representative of the Chinese Government for African Affairs between 2007 and 2012. “Protectionism and unilateralism will be a common problem faced by both China and Africa in the future,” he noted. During his speech, Xi unveiled a new US$60 billion loan and aid package to support the development of African countries, which includes US$15 billion in grants, interest-free loans and concessional loans, US$20 billion in credit lines, a US$10 billion special fund for development financing and a US$5 billion special fund for financing imports from Africa. The pledge came on top of an earlier US$60 billion promise made during the Johannesburg FOCAC summit held in 2015. Xi said the projects under the earlier package had either been delivered or arranged. In the following years, China will take the initiative in eight areas of China-Africa cooperation, and provide US$147 million in emergency food aid, send 500 agricultural experts to Africa and provide scholarships, vocational training and trade promotion opportunities, Xi said. noticeable changes in its composition. The total in grants, zero-interest loans, concessional loans, and credit lines has decreased from US$40 billion in 2015 to US$35 billion. Concessional loans are now in the same category as grants and zero-interest loans, instead of combined with export credits as they were three years ago. According to Yang Baorong, an associate research fellow in African studies from the Chinese Academy of Social Sciences, the changes come in response to the dynamics of many African countries’ economic situations. Yang said that in the early 2010s, rapid economic growth came from rising prices for energy and commodities (a major component of Africa’s exports), and China has primarily focused on promoting trade with African countries. But more recently, many African countries have seen an exodus of international capital resulting from a strong US dollar. The increased trade deficit with China has also sparked local criticism. Yang said that by reducing grants and loans and creating a special fund for developing and financing imports from Africa, China has adapted its policy to foster African industrial development and address these issues. In his speech, Xi also pledged that China would “increase imports, particularly non-resource products.” To achieve this goal, Xi said China would launch a trade facilitation initiative and implement 50 trade facilitation programs for Africa. Some of the efforts may have taken effect. In 2017, China-Africa trade volume hit US$170 billion, up 14 percent from 2016. In the meantime, Africa’s trade deficit to China reduced to US$19.5 billion, a 45 percent drop on the previous year. Nearly two decades since FOCAC began, the focus of China-Africa cooperation has in more recent years shifted from trade to industrial cooperation, Liu said. In the past, Chinese investment was often government-driven, and was typically characterized by mega-projects for which China provided all the necessary equipment and labor. Cooperation has become increasingly market-oriented, he claimed. Instead of focusing on deals and individual projects, policymakers from both sides now aim to improve the overall trade and investment environment, which Liu said would foster more Chinese investment and boost local employment. “After 40 years of reform, China has accumulated a large volume of industrial capacity, while many African countries are still in the initial phase of their industrialization. Industrial cooperation between the sides will be mutually beneficial,” Liu said. More specifically, Xi proposed an “investment-construction-operation model.” Under this model, China will help African countries to build industrial parks which will be equipped with necessary infrastructure facilities, such as energy, water and roads. Responding to Xi’s speech, Xu Jinghu, the current Special Representative of the Chinese Government for African Affairs, told media on September 4 that China’s focus in its future cooperation with Africa will be the sustainability and feasibility of projects. The policy fine-tuning also suggests China remains committed to extending its Belt and Road Initiative into the continent. In his speech, Xi said that China’s Belt and Road Initiative would complement the African Union’s Agenda 2063, and presents Africa a major opportunity for development. “We welcome African countries aboard the express train of China’s development,” Xi said. Under the Belt and Road Initiative, Xi said China would launch an infrastructure connectivity initiative and formulate a China-Africa infrastructure cooperation plan with the African Union to enhance cooperation on energy, transport, information, telecommunications and cross-border water resources. Despite criticism and doubt from commentators over China’s strategic intentions, Xi’s pledge was largely welcomed by African participants in the FOCAC summit. “The Belt and Road Initiative is compatible with the development and poverty alleviation goals of African countries,” Candith Kwati Mashego-Dlamini, Deputy Minister of Rural Development and Land Reform in South Africa, told NewsChina. “We are fully aware of the fact that future economic development needs infrastructure establishment such as ports, roads and airports,” she added. Liu Guijin told NewsChina that when China first launched the Belt and Road Initiative, African countries were among the most enthusiastic participants, and Africa has become an important component of the initiative’s landscape. In the past, cooperation between China and Africa has expanded from the infrastructure sector to the finance sector. In 2015, China signed a three-year currency swap deal worth US$4.8 billion with South Africa. Earlier in May, Nigeria and China agreed on a currency-swap worth US$2.4 billion. It was also reported that the central bank and government officials from 14 African countries discussed using the Chinese yuan as a reserve currency in the region at a meeting in late May. “With China’s new commitment, the China-Africa relationship may experience an upgrade and enter a new period in the coming years,” Liu said.